Celebrate the flora and fauna of the fifty states with this uplifting work of Americana. 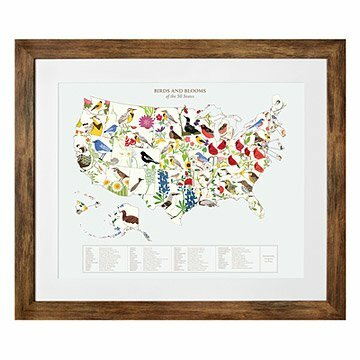 Take a cross country trip through the flora and fauna of these United States with this vibrant vintage-inspired map. Featuring art by Anna Branning and Mara Murphy, beautiful representations of each state's bird and flower spread from coast to coast. A key at the bottom details each pair of bird and blooms, allowing you to see the changing wildlife as you make your way across the country–from Oklahoma's scissor-tailed fly catcher to one of seven states that call the cardinal their own. Printed and framed in barnwood finish or black BonanzaWood® frame in Portland, Oregon. Click to see Birds and Blooms Art - Individual States. Copyright (c) 2014 - Birds and Blooms Art - U.S. Map artwork owned by Anna Branning and Mara Murphy and licensed to Uncommon Goods LLC. All rights reserved. Looks professionally framed. Beautiful print. A little larger than I imagined--pay attention to dimensions. I ordered the black frame, but the brown was shipped. I think the brown frame is actually perfect for the living room, so the error worked out great. I found the box laying flat on the porch--the instructions stated on the box that it wasn't to be laid flat. Luckily, the picture was fine. It looks great in the family room and everyone stops to look. Love it! It is a beautiful picture. The frame is not real barn wood, but rather fake plastic barn wood. It still looks nice, but the corner was smashed a little.